You know if you're a part of a fantasy baseball league, the award ceremony trophy to the winner among friends is the a highlight of year. A League Winners bat to commemorate that would be the best trophy ever! It comes with wall mounts, and each year a winner can take home this bat. 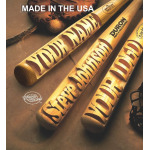 Some Leagues buy our bat each year as a trophy, but another great idea is to buy one, and have the winners sign and date the bat.